A medium refuses to give up her life without talking to her dead son. 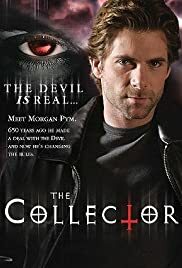 Morgan's client spins him into an alternate reality where he's no longer a collector...which may doom the client's soul. I've watched both seasons of The Collector. I must say that I do like the series. The only thing I don't like is the constant replaying of the same scenes of his past over and over again. I would say they took about 15 minutes worth of footage and used it to fill in about an hour or two worth of playtime throughout the 2 seasons. I really like the diversity of characters they bring into each episode, including the ever changing Devil. Some characters you find you want to be saved and others you just wish Morgan would push the button and send them to hell. I won't say what happened to Jeri Slate, but I definitely didn't expect what did happen to happen. You'll just have to watch to find out. :) Definitely give it a chance, I think most people will enjoy it. It's not quite as fast paced as most American TV shows, which is good and bad, but instead keeps it's own unique pace.